The indigenous tribes of the Omo Valley Ethiopia lead lives so unaffected by the outside world, and what they do need they get from nature. They aren’t primitive; the tribes of the Omo Valley just have different values and live happy and harmonious lives. With many of them oblivious to the existence of the outside world until relatively recently, we are still learning about them and their traditions. Southern Ethiopia is rich in ethnic origins, and this area has yielded the first examples of primitive man. Although the migration of people eventually lead to the population of the whole planet, the original tribes of the valleys remain. There is a rich linguistic tradition, with 45 languages spoken by tribes ranging from the Borena and Mursi, to the smaller Karo and Dassanech (or Galeb) tribes. There are a fascinating range of cultural practices, a good example being the way in which they build their homes. The Sidama, Gurage and Dorze use bamboo in their beehive-like constructions, creating sturdy homes tailored to the environment with great endurance. Other cultural practices include a variety of methods of body modification and decoration, with local materials and resources featuring heavily in the decoration applied to each tribe. 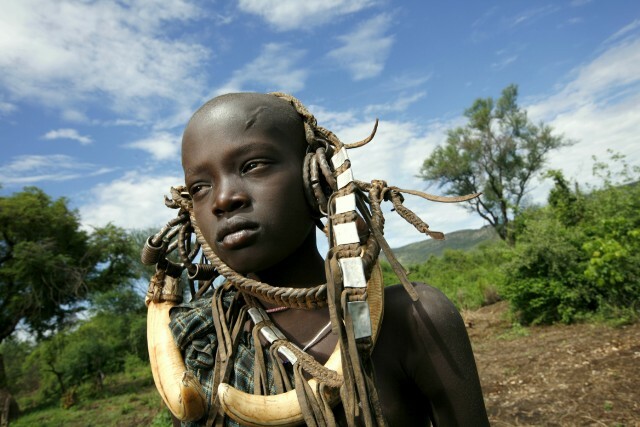 The Mago National Park is home to seven of the tribes of the Omo Valley. This is a good destination if you want to meet these fascinating people, and begin to understand the way they live and work as an integral cog in the ecosystem. With good access to the people, as well as large markets that are open to visitors, this is a fantastic way to explore the oldest culture in the world. The Dorze tribe have a rich weaving tradition. Formerly warriors, today they make a living by weaving and farming. They are a large community living north of Addis Ababa, producing some of the finest colourful woven cotton. With a rich musical tradition, the polyphonic multi-part vocals of the Dorze feature complex use of a number of elements of rhythm and melody which can also be found in Western music. of Any disputes which may arise within the group are settled by the tribe elders. Living along the Lower Omo River, the Karo tribe is one of rich, cultural rituals with the people who are known for their chalk painted bodies and amazing head-dresses. They have a ritual which signifies their passage into adulthood called the ‘Pilla’ where the adolescent boys have to jump over a number of oxen without falling to become men. With a population of around 1,000, annual flooding of the river is important to the survival of the tribe as they rely on the rich silt to grow their crops of sorghum, maize and beans.